The Krewe du Mishagos, the only Jewish marching Krewe in the New Orleans Mardi Gras season, prepared for this year's parade on Feb. 2 with a Shabbat dinner and coronation ceremony. King Lou and JAP Janna were crowned, and awards were given out to those who worked on the floats and the Krewe's signature handout, the painted bagels. The Mishagos march as part of the Krewe du Vieux, a notoriously satirical and irreverent group. The overall theme was "Habitat for Insanity," and the Mishagos went with the theme "Rebuilding the Tower of Babble." The float had a wedding-cake style tower, covered with promises and quotes from politicians about the rebuilding of New Orleans. Krewe members sported hardhats, many with sidecurls, and nail aprons that were decorated with Stars of David and filled with toy tools. The parade went through the French Quarter and Marigny on Feb. 3. The Vieux is an old-style parade, with small, mule-driven floats. Krewe members, except the royalty, march behind the floats and pass out their throws. 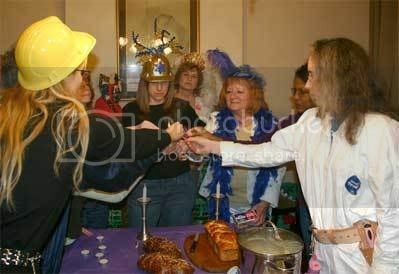 The Krewe du Mishagos lends a Jewish flavor to the proceedings, often poking fun at Jewish stereotypes. Until a split before last year's parade, the Krewe was called the Krewe du Jieux. This year, the "wandering" Jieux held their own "Running of the Jieux" in tribute to the Borat film, then watched the parade as a group. Earlier in the day, a Catholic group protested blasphemy from the 2005 Vieux parade. One of the offenses mentioned was the Krewe du Jieux float, which spoofed "Jieux for Cheesus," with Krewe members dressed as cows. Mishagos Captain Joel Nitzkin was "astounded" that there was a protest, and reckoned that if a group was labeling that parade obscene, one could argue much of the church's history of actions against the Jews was obscene. 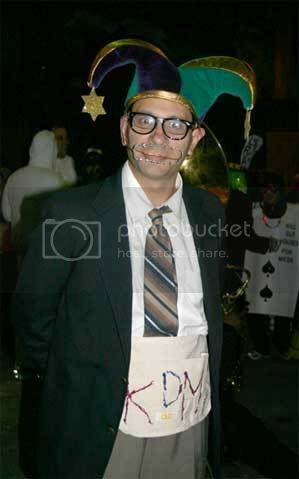 The Krewe's "eternal Bar Mitzvah Boy."